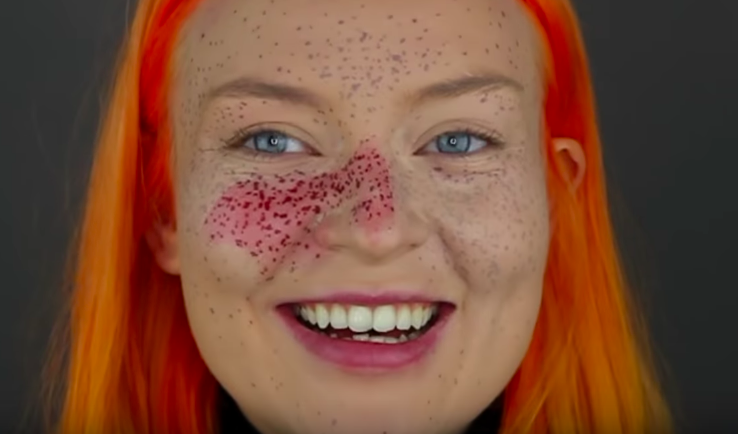 A beauty blogger attempted to give herself semi-permanent freckles using henna, but her makeover went disastrously wrong. Luckily she caught the whole thing on camera, so we can all learn from her mistakes. 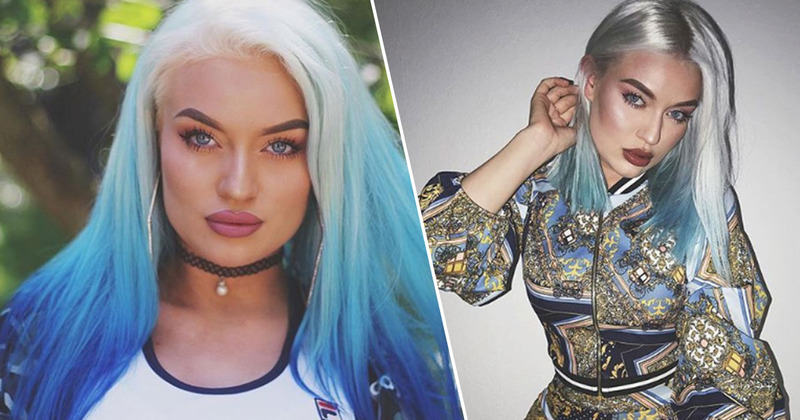 German beauty blogger Naomi Jon is a successful YouTuber, with a page boasting over 746,000 subscribers hoping to be inspired by the fashion and beauty tips in her videos. Naomi posts videos of herself testing out make-up brands, offering tutorials and dying her hair, but one of her most recent videos should be used as a warning against certain beauty products after an attempted makeover ended up with the vlogger resembling the murderous doll Chucky – her words, not mine. Naomi opens the video by saying she plans to do an experiment in which she will give herself permanent freckles. She explains she was inspired by an Instagram video she’d seen on the page ‘Uglysxegirl’ of a girl doing the same thing using henna, and though she’d wanted to give it a try for a long time, she’d only just got around to it. After meeting the girl from the video and learning what products she’d used, Naomi set about trying the look on herself. Talking viewers through her process, the vlogger explained she’d bought the recommended product from eBay and followed the Instagrammer’s instructions when it came to choosing the ‘more natural’ colour option. After opening the box of henna the German host admitted it didn’t look like the same product her inspiration had used, and though she said she was ‘kind of scared’, she went ahead with her experiment anyway. I think it was at this point Naomi should have perhaps done a sort of patch test with the henna to see how her skin reacted, similar to before dying your hair, but she was determined not to be a ‘chicken finger’ (coward) about the situation and confidently applied dozens of freckles to her nose and cheeks. 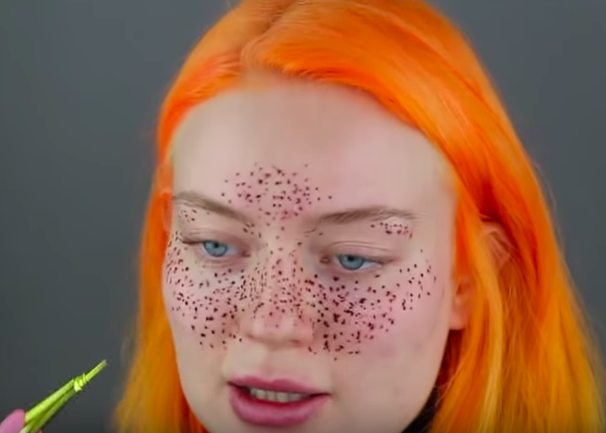 After covering half of her face with henna spots the German blogger asked if it was normal for them to burn; but rather than use this as a warning sign she strove on, admitting she wasn’t even sure if she was allergic to the product. After leaving the henna on for the allotted time Naomi attempted to wipe it away, only to find the dots remained just as vibrant. Rather than leaving her with faint, natural-looking freckles, the henna simply served to make her skin an angry red. 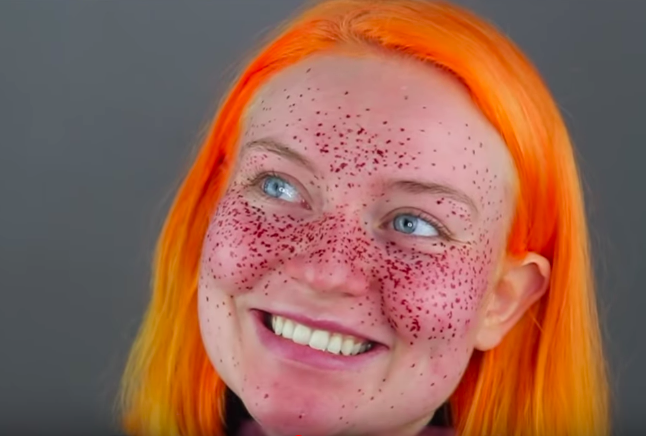 The vlogger made a desperate plea to viewers, asking if anyone knew how to get the henna off her face, and eventually branded the experiment a ‘total disaster’. Naomi turned to her collection of heavy-duty foundations to cover her new semi-permanent freckles, but not even they could hide the disastrous spots underneath. I regret everything. I actually wanna cry. I think I am gonna cry when I finish this video. I need to go to work tomorrow and it’s not even possible to cover this. I’m gonna go through hell. I think it goes without saying – maybe don’t try that at home!